Placing your order online you are guaranteed of receiving our most competitive prices. Many of these prices are reserved solely for purchases made on our website, due to ease of processing this type of order, and therefore are not available for orders placed through any other means. All items displayed on our website are shown in UK pounds sterling, and payments may be by credit or debit card through our secure server. 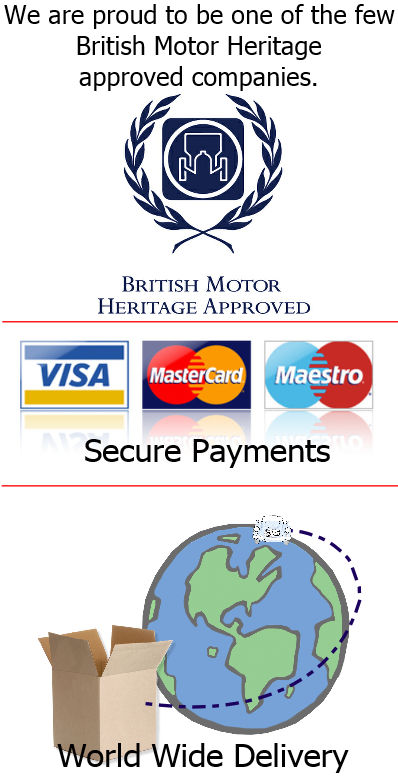 Payments are taken at the time of purchase, should any further payment need to be made i.e. additional shipping costs / items added after purchase etc. You will be contacted via email and an invoice to pay these charges will be sent to you. Although our website uses the original part numbers for reference purposes, the use of these part numbers does not refer that the goods supplied are genuine, or that the quality is equivalent to that of the original components. Whilst a few parts may be sourced from the original suppliers, the majority of parts available now are reproduction, and modification to some components may be required in order to obtain a satisfactory fit. In the instances where there is a choice of two different qualities for the same item, the lesser quality item will be identified with a "z" suffix after the part number. However, even in these instances the use of the original part number does not infer that this item is of equal quality to the genuine part, only that it is of better quality of the two. Although we aim to dispatch orders within 24 hours of purchase, please note that this is not always possible. We regret that at this time we do not keep live stock on our website and delivery times will be subject to stock levels. Should we need o order a part from our supplier to complete your order this will be done so as soon as possible and orders are normally completed within a few days. Should we not be able to supply an item, or if the delay for completion is going to be longer than expected we will contact you as soon as possible. At the time of dispatch you will be emailed with a tracking number so you are able to track your parcel, if you need to re-arrange your delivery you can do so on the couriers website. If you require to add a note to your order such as "leave wit a neighbour" "leave in a safe place" please add this to the comment section at the time of purchase. Please note all parcels should be checked for damage and signed for at the time of delivery, should you wish to "leave in a safe place" and specify to leave your parcel without a signature this is not a problem, however this is done so entirely at the customers own risk, neither MSC or the delivery company will accept any responsibility for loss or damage to consignments delivered in this way, and therefore we strongly recommend to ensure that there is someone available to receive and check your delivery carefully. Should your parcel arrive damaged we request that you or whoever is receiving the parcel sign for it with the courier as damaged. Any claims for the parcels which have not been signed for, or signed for as "unchecked" and which subsequently turn out to be damaged, will not be covered under the carriers terms of insurance. *Qualifying purchases exclude VAT & delivery costs. Offer applies for one box to be sent FOC, multiple parcels will be sent at a reduced rate. Offer only applies to order placed n www.msc.parts. Free delivery cannot be used in conjunction with any other offer or voucher. Offer does not include the delivery of any engines, panels or wheels. Offer is available until the specified date on the front page of msc.parts only, orders made before or after this date will not be eligible for free delivery. Malta & Balearic Islands will not be included in the EU offer and are only eligible for the £20 discount. Should your order qualify for "free delivery" and upon receiving your goods wish to return any items for a refund, if the value of these goods then reduces your order subtotal to below the qualifying "free delivery" amount, the shipping amount will be deducted from your refund balance. We currently offer a number of items that have been reconditioned, these items are supplied on an exchange basis and come with a surcharge applied at the checkout at the time of purchase. This surcharge is refundable once we have received your old unit in exchange. Please note all old units sent to us for exchange must be clean, in a serviceable condition, drained of fluid (where applicable), they should be identical to the type supplied and must not have been modified in anyway. We reserve the right to retain all or part of the surcharge if these conditions are not met. Some reconditioned items that we offer are supplied on a "one for one" exchange basis. This means we will need to receive your old unit in advance for reconditioning. However you will be contact by one of our team if this is the case. Although we aim to return your surcharge as soon as possible after receiving your old unit, please allow up to 14 days for inspection before receiving your surcharge refund. Please return your old units with your contact details and a copy of your original order or invoice, if we do not receive this information with your return it will be impossible to refund your surcharge. All return payments must be made in the same way, and into the same account in which the original order was purchase. We are unable to refund payments by an additional method, or into another persons account. Please be aware that "reconditioned" or "rebuilt" items have been stripped, cleaned, inspected and re-assembled. During this process parts showing signs of wear will have been completely replaced or suitably renovated. PLEASE REMEMBER that these items are not brand new! All items whether new or reconditioned provided by MSC have a 12 month warranty unless otherwise specified. This warranty period commences from the date on your invoice, and not when the parts were fitted to your vehicle. The warranty covers defects to the item provided only if it is fitted to the vehicle it is specified for, in the correct manner and for normal everyday use. The warranty on our parts is not covered for any sort of competition, racing, rallying, kit build, modified/adapted vehicles, or anything other than their original intended use. Our warranty also only covers the parts in question, and does not cover any consequential cost or loss, such as garage labour, recovery, car hire or re-delivery. A claim will also not be validated if failure is caused by miss-use, neglect, overheating, incorrect instillation, or failure of any other part. All goods sold on a "mail order" basis are subject to a 14 day cooling off period. Should you decide that once you have received your order you no longer require some or all of the items , you can return them to us for a refund. However please note, you must contact us within 14 days of receiving your items. If items that have been sent or ordered in error are subject to the same conditions. Please return all goods with your contact details and a copy of your invoice so we know who they relate to. We will be unable to refund the cost of any items returned without this information. All items returned to use for a refund, with the exception of faulty items and items received in MSC error, are returned at the cost of the customer. If you have received a faulty item, or an item in MSC error, please contact us before returning the item/s to us. Please keep your proof of postage and let us know the return delivery cost, we will then include this with your refund for goods. Please note all returns, with the exception of faulty items, should not have been fitted, and should be in the same condition in which they were sent to you, this includes any sign of oily fingerprints on the outside packaging, such as branded boxes. It should be possible with all returned items (with the exception of faulty items) for MSC to supply these items again as new. If an item is simply not required or the item/s is returned in the condition in which we cannot sell as new (with the exception of faulty items) MSC reserves the right to charge a 15% handling charge to return items to stock. Should they not be in the same condition, in some cases we regret that it may not be possible to refund you for the items, and they will be returned to you at your own cost. All return payments must be made in the same way as the original payment, and into the same account in which the original order was purchased. We are unable to refund payment to an additional method, or into another persons account. Please note all trim is manufactured to order and in some cases is a special order item, meaning that it will not be eligible for a refund. Other trim will be refunded but MSC reserves the right to charge a 15% handling charge to return these goods to stock. It is unfortunate but in some cases an item may be supplied which is faulty. If this is the case please contact us as soon as possible. You may be asked to supply pictures of the fault, or in some case asked to return the item for further inspection (please return all faulty goods with a copy of your invoice, your contact details and a complete description of the problem). If this is the case the customer is responsible for the initial cost of return, if the item is then found to be faulty after inspection, we will then refund this delivery cost, so please keep proof of postage. If no fault is found we will do our best to advise why you have had a problem, however the cost to return the item to you will be down to the customer. W regret that it is not possible to provide a replacement in advance of having the faulty itm returned to us and tested. If you would like to purchase a replacement in advance this is not a problem, we can the refund you for the item should a fault be found with your returned item. However please note if no fault id found with your returned item, this item will be returned to you at your own cost. All return payments must be made in the same way as original purchase, and into the same account in which the original order was made. We are unable to refund payments through an additional method, or into another persons account.